The worst rated GP surgeries in Hastings have been revealed, based on ratings by patients responding to the NHS patient survey. 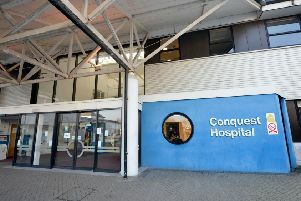 A total of 24 practices in Hastings have been rated after patients were asked about their experience on behalf of the NHS in March 2018, including how they rated the surgery where they are registered. According to the NHS, a practice that scores below a 70 per cent average rating is considered to be 'among the worst', while a practice which scores 90 per cent or above is 'among the best'. Those rated between 70 per cent to 80 per cent are classed as 'OK'. “The GP Patient Survey is sent out twice a year to around 1.36 million adults who are registered with a GP in England. "The results of the survey for each GP practice are weighted to adjust the data to account for potential differences between the demographic profile of all eligible patients in a practice and the patients who actually complete a questionnaire. “When using indicators to make comparisons between General Practices, it is important to consider the context in which GP's provide services. “For example the characteristics of the patients treated by a practice – in terms of things like age or deprivation – can affect the value of an indicator, unless these factors are taken into account when the indicator is calculated.